Този втори том БАРД НЯМАТ ПЛАНОВЕ да издават, но а сметка на това пък пускат друг Том 1 - Рей Бредбъри, том 1 - избрано: 451° по Фаренхайт. Смъртта е занимание самотно. Гробище за лунатици - срещу 20 лева можете да се сдобиете с 3 ромата под една корица. Всичкото това, хубаво, но какво да правят тия като мене дето имат стари издания на общо 2 от трите романа? Да си купиш отново 2, за да имаш и третия?! Ето защо някак си не съм изненадан, след като се изгавриха с читателите отново години по-късно с Поредицата от Злополучия на Лемъни Сникет - спряха издаването след четвъртата книгка, нищо че пълната колекция е от общо 13! Историята се повтори и с Джак Спароу, приятни леки романченца за приключенията на героя като хлапак, преди събитията в "Проклятието на Черната Перла". Историйките са нещо като Войната на Таралежите с пирати, и ме кефеше как допълват филмите, да не говорим пък, че бяха по-интересни от тоталното мазало в което се превърна поредицата с третата серия. Миналата година след издаването на деветта книжка, Егмонт обявиха, че нямат планове да издават следваща. Девет от общо 13, това май им е рекорд? Star Wars: Knights of the Old Republic is an interactive cinematic experience by itself. This week I give you a double feature - the USSR sci-fi shorts Звездный мир: Вампиры Геоны (1991)and Звездный мир: Хозяева Геоны (1992). Atmospheric dark sci-fi with great soundtrack, if "Alien" was animated it would be like this! there you can check out pages of his comic books on which the shorts are based. I'm on a roll with the space westerns! You could hardly hear the train clattering on the rails. As a matter of fact with all those kids shouting, laughing and singing all over the car you could hardly hear even your own thoughts. They were all older than me. I was still in kindergarten and they were all students. But they were my father’s students! And I was fortunate enough to join their summer camp that year. We were on our way to the seaside. It was one of those old train cars with no separate compartments, where you can see everybody and walk around… Dad was chatting with his colleagues, some of the students were playing cards, chess or simply arm-wrestling, some were listening to music, others were walking around and enjoying all those simple pleasures you get on the train, like sticking your gum under the seat, or spitting out of the window… But not me! I had a far better occupation! I was choosing my destiny! Two of the guys had a bunch of books with them… Colorful covers illustrated with knights, dragons, ninjas, goblins and all sorts of things that can set your imagination on fire and make you crave for adventures! Those were the first gamebooks I had seen. The rest of the world had known them for years, but they were something completely new for the Bulgarian kids in the beginning of the 90s. We had no idea about Role Playing Games, never heard of “Dungeons and Dragons” or such, most of us didn’t have PCs but even if you were one of the few lucky fellows – the graphics in those 5,25’-Floppy-Disc days could hardly compete with the adventures described in the gamebooks. I was trying to spell from my space and dinosaur encyclopedias ever since I got an idea about the letters. But in the beginning when my parents bough me my very first gamebook, “The Castle of the Goblins” (“Замъкът на Таласъмите” от Колин Уолъмбъри / Любомир Николов) my reading was still kinda slow, so it felt much more enjoyable when others were reading aloud for me and I was taking the decisions. It must have been 1992, because I remember that dad bought me my second game book, “The Master of Darkness” (“Господаря на Мрака” от Джордж М. Джордж / Георги Миндизов), just before he took me to the cinema to see “Jurassic Park”, and “Jurassic Park” came out in 1993 - the year when my bro was born and I started school. In school my reading got a lot better and I would spend many nights reading gamebooks till late hours. I virtually grew up on those books and they were the reason for me to get interested in literature and get my first library card. So no wonder that I was really pissed off when my literature teacher in secondary school claimed that gamebooks cannot be classified as literature by any means. Boy was she wrong! There were both Bulgarian and translated foreign gamebooks on the market. Among the best translated titles were Steve Jackson’s Sorcery series and also his world-famous collaboration with Ian Livingstone – the Fighting Fantasy series. The very first Fighting Fantasy book, “The Warlock of Firetop Mountain” was actually published in Bulgaria as number 3 as “Магьосникът от Огнената Планина”. I remember the day I saw it in the bookstore down the street. They sell snowboards and sportswear there now, but back in those days it was a great bookstore, filled with the smell of coated paper and fresh-printed ink. I begged my mom to buy me the book and I was jumping with joy when she agreed. Instantly it became one of my top favourites! A couple of years later I gave the book to one of my classmates. He didn’t return it for moths and I was about to use my fists in order to persuade him to give it back. I was heartbroken when he told me that he had lost it and offered me some money to cover the loss. But it was a loss you cannot cover. The book was rare and out of print for years! I searched for a copy everywhere but I couldn’t find one. Some years later, on my way back from school I stopped by a second hand book stand. It was a religious experience! I went through a heap of gamebooks and suddenly there it was!! 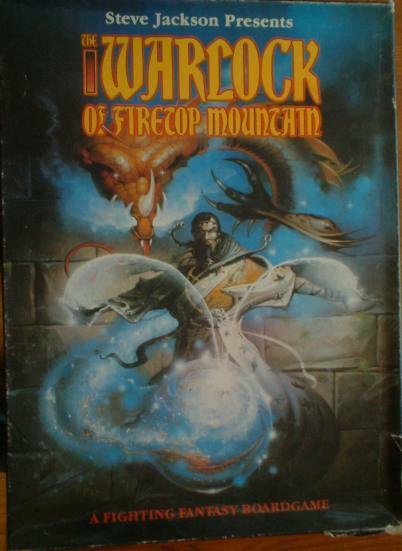 “The Warlock of Firetop Mountain”! My heart was pounding in my chest, I could hardly believe this miracle! But… but I had no money. It wasn’t expencive, it was just that my pockets were desperately empty! I was holding the book in my hands and I felt that if I leave it there for even one day I may never see it again. What if I come back tomorrow and somebody else have bought it? I couldn’t stand the thought of losing the book again. I looked for the seller. I saw him sitting on a chair behind the stand. He was an old, blind man. Iremember that I had seen him from time to time on the bus on my way to school. I went to him holding the book and asked him to give it to me even though I couldn’t pay. I promised that I will come back as soon as I can and pay, but he didn’t want to listen my promises. He just said “Ok, you can take it”, and I think he smiled slightly. I was so happy! I runned, no, I flied home! I’m not sure, but I think that the next day I went there again and the stand was closed. I went there again and told the man “Maybe you don’t remember me, a few days ago you gave me a book and I came to pay for it…”. "I remember” –he said and I think that again he slightly smiled. “I knew that you’re an honest boy”. And I gave him the coin… I will never forget it – the bland man who was selling books and the trust he had in me. In the years to come the gamebooks became bestsellers, they developed and evolved in various ways, new rules were coined, thew ideas were explored, there were several publishing houses which focused especially if not only in this field. New titles were printed every week. Stories from every genre from fantasy and science fiction action adventures to horror and detective stories and even historical and sport gamebooks. The Bulgarian gamebook writers were sort of celebrities now (you can’t even imagine how happy I was when I got “The Castle of the Goblins” and its two sequels signed by the author Liubomir Nikolov at a convention in Plovdiv). We fans found out that they were using pen-names because in the beginning some policy was forbidding them to use the gamebook pattern as if some foreign publisher owns the rights to the idea. So our Bulgarian publishers found a way to get around this rule – they pretended that they publish only translated gamebooks! And by the way American authors were selling better, especially in the beginning of the 90s, when we had just abolished communism and our society was hungry for “decadent western culture”. The authors were hiding behind their western pen-names. Later on things changed and they could use their real names but the pen-names had become a tradition – they continued to use them even after they uncovered their real personalities. For some reason the gamebooks’ golden age faded away and I can’t help it but get nostalgic talking about this. They are no longer being published (or at least not in Bulgaria). Some of the kids these days have heard about them from their older brothers and sisters or maybe even have read/played a book or two. You can find dusty volumes at second hand book shops. Fantastic adventures awaiting on forgotten shelves. And if by any chance you happen to find some of these books… do not hesitate! Take it. Turn the page over… and Decide Your Destiny! 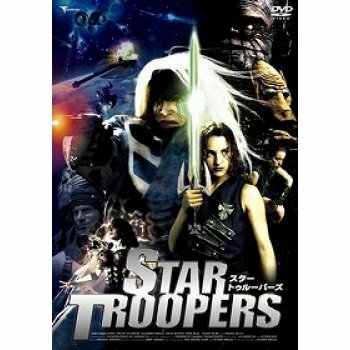 El Barón contra los Demonios aka The Baron Against The Demons aka Star Troopers is a movie I want to see desperately! 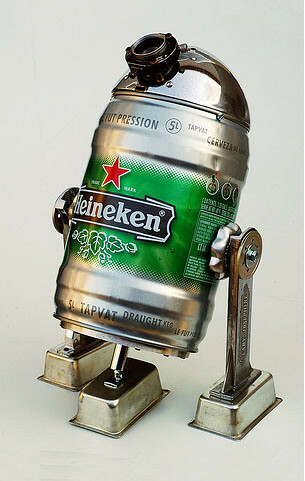 It looks just brilliand and I've been looking for it for more than two years, but still can't get my hands on it. В събота рано сутринта екипа на телевизията се натовари на автобуса и потегли за съседна Турция. Изяде се маса баклава, накупи се маса локум и се изля маса простотия. Here is a neat CGI short animated aci-fi film by Marco Spitoni. I'm not interested in the anime itself, it's not my kind of plot, but I still love the Black Heaven poster! 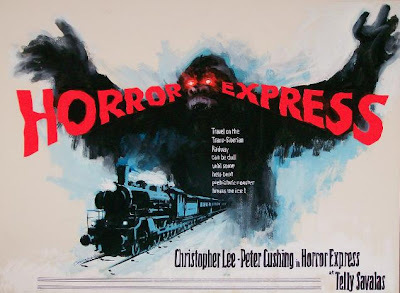 Remember an old horror movie with Peter Cushing, Christopher Lee and Telly Savalas -"The Horror Express"? It's about a train going through Siberia and some weird events going on... Transporting a frozen prehistoric creture, presumably "The Missing Link", through the Russian wilderness and before you know it the creature comes back to life and flashing around with glowing red eyes it leaves a trail of corpses with bleeding eyes and as if that is not enough by itself the train is attacked by Cossacks, it comes out that the prehistoric creature is actually just a body "inhabited" by an alien form of life that came to Earth a billion years ago and just when you think it can't get any worse, the creature resurrects all the corpses and the train gets full of zombies!! The meeting was to start at 14:00 so I had some time to kill and I met with Temenuga, a girl who gave me and Ania some shelter when we were in Sofia, a good friend of mine. We wakled and talked, went around the bookstores where I couldn't resis but spend some (ok, ok, not "some", "a lot of") money on a great big encyclopaedia in English about the history of the comics and graphic novels. Then I met with my Star Wars pals, we had some beers and we were talking about life in general, how cool the new "Clone Wars" TV series are, trying to remember if we celebrate 5 or 6 years birthday and so on... Time is never enough when you are with friends, I know that well, cause even four months in Poland were not enough. When it was time to go some of them came with me to the station and thank God, cause otherwise maybe I'd miss my train - it was in some remote area with no lights at all, only the red stops of the back car were on to indicate that there is something out there. All of a sudden something falls outside in the coridor! I see a man, going down like a cut down tree and BANG! on the floor! I left my book right away and opened the door. 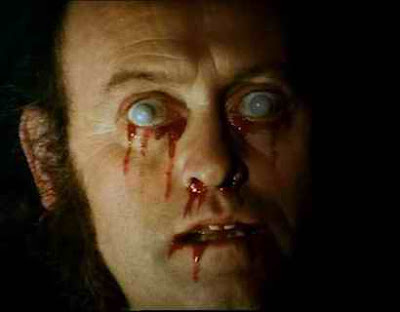 A man at about 60 was laying down in the coridor, he wasnt moving at all, his eyes were open... I kneel and I ask him "Are you OK? I will help you to stand up..." no reaction at all. His eyes are so dim that I can't really tell if he is blind or drunk or something else. A frame from "The Horror Express"... believe it or not, but the guy on the floor looked a lot like this, only without the blood. I didn't feel any strong smell of alcohol. Are you OK? no answer, I wave in front of his eyes and I get no reaction at all, he moves his hand a bit and blinks, so he is alive ok, but still... What can we do? I ask and the girl has no idea. I go around the car to see if the ticket control guy is around but he wasnt. I ask the man again if he wants me to help him and f he will stand up but he doesnt respond... What can we do? I close the door and the girl is scared and stressed, and I tell her "Wow, geez, what kind of things happen on these trains..."
I see some movement in the coridor and I open teh door again. Out of the next compartment there's a guy coming out, 60 something, and ugrly as hell, like some drunk-London-beggar-criminal-right-out-of-Oliver-Twist or something. His hair greasy, his clothes dirty and his face crooked in a horrible grimace. "Do you know him?" I ask and I point at the guy on the ground. "Is he from your compartment?" - he waves and makes some sounds that cannot be possibly categorized as human speech. "Wont you help him stand up?!" and he waves with his hand like trying to say "The hell with him, leave him there, who cares!" The ugly guy came again and again, waving at us and guesturing like "the other is crazy, he is out of the train", then he went away... and we were sitting there talking, then this guy walked down the corridor again! So after all he didnt fall out!! Thank god! After some time the ticket control guy came and put some order into things, "Come on, I wont deal with you all night!" and I think he threw them out of the train on the next station or something, I dont know. And this girl was telling me "So you see, you wanted to direct movies and you find yourself in a movie! Who could direct this crazy thing?" So finally it was her stop, we exchanged phone numbers and then I was waiting alone for my stop. Before I was back home and that's the end of my adventure! Графа, Нора, P.I.F., група Акага, Сантра и Кристо, Боряна Бонева, Респект, Automatic Flowers, Heptagram, Reknail и Slawek ще се включат в благотворителен концерт, който ще се проведе на 21 март в Античния театър. Целта е да се съберат средства за лечението на 7-годишния Николай Банков от Пловдив. През лятото на 2008 г. той пада в басейн и това е последвано от 25 дни кома. Следва будна кома. За щастие момчето вече е в съзнание и разбира всичко, което се случва покрай него. Ники обаче все още не може да говори и да се движи. Посещения на рехабилитатор струват на семейството му по 100 лв. всеки ден. За да се възстанови, е нужна рехабилитация в Израел в продължение на 5 месеца. 80s saturday morning cartoons can't get any better than this! Absolute beauty! Just look at it - pterodactyls flying down there, flying saucers from above, half-naked chick at your feet... You just gotta see it, don't you? The best anime opening ever! Stylish as hell! Румени, засмени... БЕЛИ И ЧЕРВЕНИ!